The Haniffas Holiday Inn is located in Peradeniya a small village which is 6km far from Kandy City. It takes 10 min by bus or by tuc-tuc to get into town. The property is located within walking distance to Kandy's famous Botanical Gardens. The bus stop is 200m far from the bungalow. The train station (Peradeniya Junction Railway Station) is 5 min ride by tuc-tuc. The rooms which can be used as single or double rooms. They come with a private bathroom including shower. 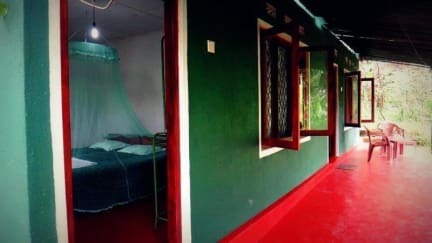 The double bed comes with a mosquito net. 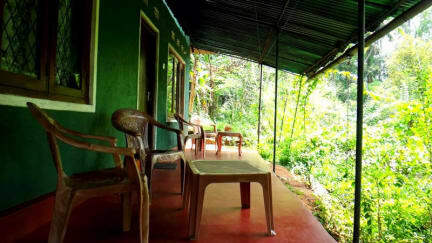 In front of the bungalow there is a small terrace on which you can sit and enjoy the view of the mountains the forest and the nature. Additional to the accommodation we offer breakfast and dinner which is traditional home-cooked Sri Lankan food . On top of that We offer accomodation & personalized tour services to suit all budgets and tastes. These services can accommodate individuals, groups or Families .